Explore the strengths of a role model! Mentors are a type of role model who can positively influence the character of their protege; learning from mentors has been described as one of the three major paths to developing wisdom. 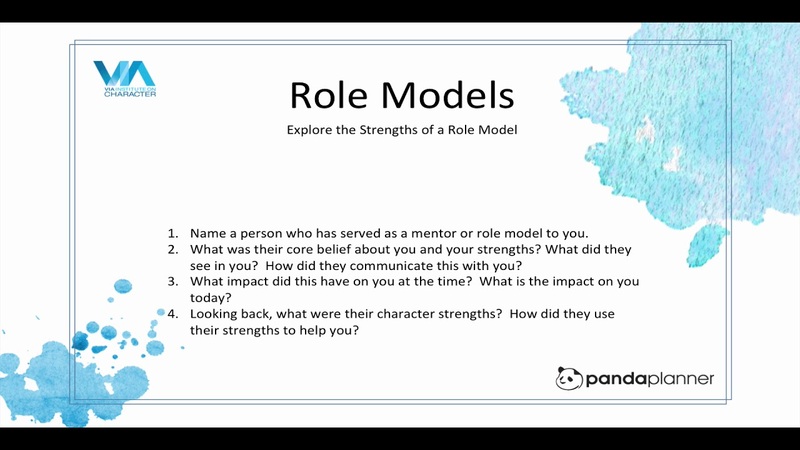 In this exercise, you’ll explore the role of one or more mentors/role models, past or present, in your life. Name a person who has served as a mentor or role model to you. What was their core belief about you and your strengths? What did they see in you? How did they communicate this with you? What impact did this have on you at the time? What is the impact on you today? Looking back, what were their character strengths? How did they use their strengths to help you?